Still on the topic of squirrels, there’s apparently a new sport going around called “Squirrel Fishing.” It’s like fishing, but, as hinted at by the name, it’s for squirrels. You put nuts on the end of a line (no barbed hook, I guess, since you don’t want to hurt the critters), and try to lift the squirrel into the air as he nibbles. 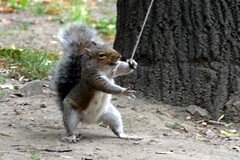 See Squirrel Fishing: A new approach to rodent performance evaluation for more information. Annie has also documented her Squirrel Fishing attempts, and there is, of course, a Flickr tag and a Flickr group for the sport.